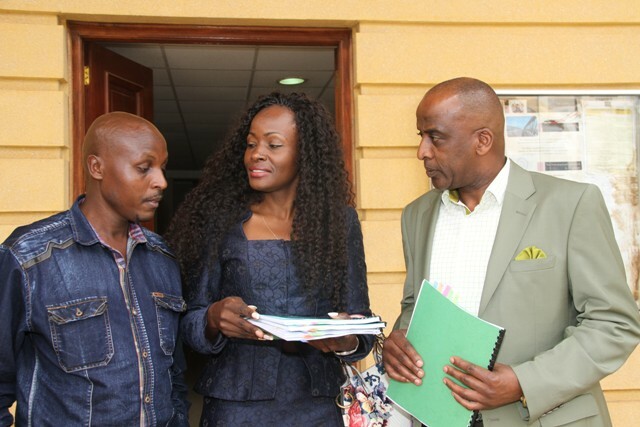 Lawyer Edna Arati (centre) leaves Milimani law courts accompanied by political activist Japhet Moroko,(left) and city politician Gitonga Wathanga, after hearing of an application seeking to have the parliament dissolved on the grounds that it have been unable to pass key constitutional bills before the August 27th deadline. High court has declined to dissolve the parliament and directed the human activist to file and serve the petition to respondent. Justice Mumbi Ngugi said she cannot issue expartie orders since she has not heard both sides. Human rights activist wanted the court to dissolve parliament for failing to play it constitutional as it’s enshrined in constitution. He argues that the decision by the parliament to extend the passing of the key constitutional bills by a year is unlawful. Moroka want the current parliament dissolved and new parliament elected to allow it to enact the required legislation. Moroka moved to court on Thursday to contest the decision by Parliament to extend the enactment of 28 Bills by twelve months. Under a certificate of urgency, Japhet Muroko has accused the August House of unlawfully and procedurally doing so on August 25. Consequently, the petitioner wants the decision by Parliament declared a nullity and the latter quashed by the High Court. He has accused Attorney- General Githu Muigai of failing to legally advise the National Assembly that move is unlawful. Muroko also contends that the A-G has neglected to consult with the Commission for Implementation of the Constitution (CIC) on the issue. He now wants CIC compelled to prepare fresh bills in accordance to the 5th Schedule and Article 262 of the Constitution. The activist insists that Article 261(1) does not allow Parliament to change titles of the Bills and ought to pass all legislation as specified without amending the Chapters. And according to the petitioner, the current Parliament should be dissolved in accordance to Article 261(7) and a new Parliament allowed enacting the required legislation under article 261(8). “ The High Court should declare that the National Assembly failed to enact all legislation as enumerated in the 5th schedule and in accordance to Article 261(1) and should therefore be dissolved forthwith,’’ he states. He claims that the purported extended 28 Bills published by Commission for the Implementation of the Constitution and Parliament are not amongst the Bills enumerated in the 5th Schedule. “The 28 bills extended by Parliament on the August 25 2015 are conspicuously missing in the 5th schedule,’’ Muroko claims. Further, the petitioner wants CIC to furnish the High Court with all the Bills it timely prepared and forwarded for deliberation, reading and passing by the National Assembly. In addition, he wants the provincial administration dissolved to enable Article 262(17) take effect under the constitution. “District commissioners, division officers, chiefs and sub chiefs are stopped from conducting the functions not listed in the constitution,’’ he adds. The matter is set to be heard on 8 of September for interparty. COURT EXTENDS ORDERS AGAINST SACKING OF GARISSA COUNTY OFFICERS.